You might have thought that the Gionee Elife S5.5 (also known as Walton Primo X3 Blade in Bangladesh ) is the world’s thinnest smartphone ever but here’s Gionee again publishing a teaser of another smartphone coming out which would be even thinner than the previous. As the name, the Elife S5.5 measured 5.5mm in thickness making it a really sleek phone worth catching everyone’s eyes. It seems Gionee isn’t satisfied with already having the ludicrously skinny smartphone available in the market and will go instead to produce even more slimmer smartphone. 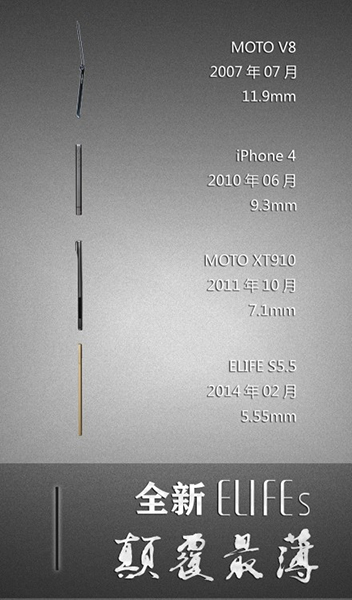 The teaser takes a walk down the memory lane showing the smartphones and its thickness over the years ending it with their own Elife but with an unknown measurement, most likely to be under 5.55 mm. There’s a high possibility that it can come close to the 5mm barrier but this would also mean that all the components would have to be squeezed inside the pack. Most importantly, the phone might even come with a small battery unless and until Gionee can come up with some cool innovation to make the battery last longer. If this comes out, be sure to expect it to come under Walton’s brand! Maybe X4?